My sister calls me the canary. As in, what the miners used to send down into the mines to warn them if it was hazardous. 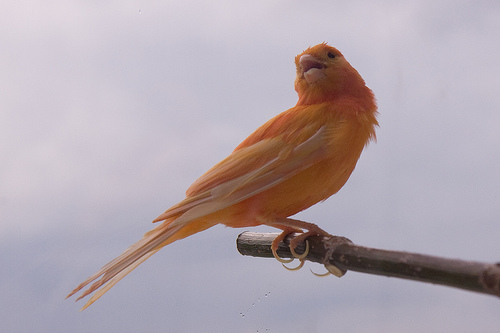 You see, the canary’s delicate nature would warn the miners of a toxic environment. If the canary was dead, get out of the mine. It is a dangerous world for canaries. Yet I am alive today because of my canary nature. Not a day goes by that I don’t curse myself for being “so sensitive” be it to pain or susceptibility to illness or smells or emotions, et cetera et cetera. I had a bottle of Advil on the bedside table. I could have reached for it, taken a couple and fallen back to sleep to my death. Literally. I had the worst headache I’ve ever had (depsite years of debilitating migraines) but my mind was too addled from the carbon monoxide choking out my red blood cells and blocking oxygen to my brain to realize it. I was disoriented to the point that it had seemed normal to be so woozy in the bathroom that I had to lie face down on the floor for awhile before getting into bed. So woozy that the train-like whooshing in my ears just seemed a nuisance. Woozy enough to ignore being ill for hours, moaning in misery. But even in my semi-conscious state, I remembered that ibuprofen makes me feel sick if I take it on an empty stomach, one of my many sensitivities. I managed to get myself up, go from the bedroom to the kitchen and get myself some yogurt. I don’t recall whether I ate it or was attempting to carry it to the bedroom but I know I didn’t make it back. I was staggering my way across the living room, so dizzy the floor seemed to be tilting, when I fell. “Do you need to go to the hospital?” he asked. Did he save me or did I save him? For years, I thought he saved me. But without my canary tendencies, without my fall, we would have slept on, eternal sleep. So really, being sensitive and falling down saved my life equally I suppose. And love. For all that wasn’t, my ex and I loved each other. His love and concern for me was enough to pull him out of a poisoned stupor. I think I like those metaphors. Being vulnerable to small things and failing at something as simple as walking across a room ended up being saviors. If I were tougher, if I’d been able to cross that room just a little better, I’d be dead. Without love, I’d be no where. Instead I am alive, soft and just-canary-enough.